The goal of the “Otwarte Zabytki” (“Open monuments”) project is to engage citizens in using, re-using, correcting and collecting open data about cultural heritage objects in Poland. We are building, through our crowdsourcing platform otwartezabytki.pl, on data from the official register of historical objects and buildings that was opened by The National Heritage Board of Poland. We are continuously correcting and extending information from the registry. We treat cultural activity as one of key spheres of civic engagement and open culture education. Working with heritage data can become a gateway experience leading to a better understanding of the open government model. Our application has open code published on GitHub. And whole other content is available on CC BY-SA 3.0 license. The process of teaching and learning in Open monuments runs from the bottom up. It involves especially libraries, NGOs and cultural animators. Our project is an educational tool regarding not only the monuments, but also the technical issues and the basics of copyright law. To use the website one must not only possess the necessary skills to use applications, search engines, etc., but also be aware of open access, free content, know where to find legitimate resources and how to publish under CC licenses. 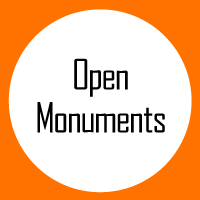 Open monuments inspire training techniques for “umbrella organizations” working with seniors disadvantaged in the digital world. We use feedback from users to improve our service and enhance it for another applications (eg. used to check the material shape of historical sites, to notify alerts). We have been running the project since 2012 and have received broad interest from media, NGO’s and individuals, sharing with us data, information and photos of cultural heritage. Last summer over 7000 people took part over the period of a month in a national crowdsourcing action focused on checking, updating and providing basic information about historical objects from the registry. This was a first crowdsourcing action of such scale in Poland. We’ve created website, where each monument has its own profile. From that time users have added hundreds of pictures and descriptions of historical objects. They have also added many objects to the database, that in their opinion should be preserved. The project is particularly popular among local communities – libraries, local authorities and schools. 1) data improvement and coding of new widgets / functionalities. – “Adding pictures via mobile device” (allowing to add pictures directly from a mobile device). 2) civic engagement through a range of activities, mainly educational in character. It is beneficial to conduct activities well defined as methods for working with open data – such as hackathons, design thinking workshops on a single set of data, in order to determine the usefulness of varied approaches. To these, we add novel approaches, like heritage walks that combine sightseeing with a crowdsourcing workshop – with the goal of seeing, how such new methods build interest and engagement in the open government model, and design thinking workshop. Our audience are mainly persons 45+.